Most Montana conservation organizations were disappointed to learn Thursday that former oil industry lobbyist David Bernhardt will take the reins of the Department of the Interior. In early January, President Donald Trump fired former Montana Congressman Ryan Zinke from the position after the Interior Inspector General started investigating Zinke for multiple ethics violations. 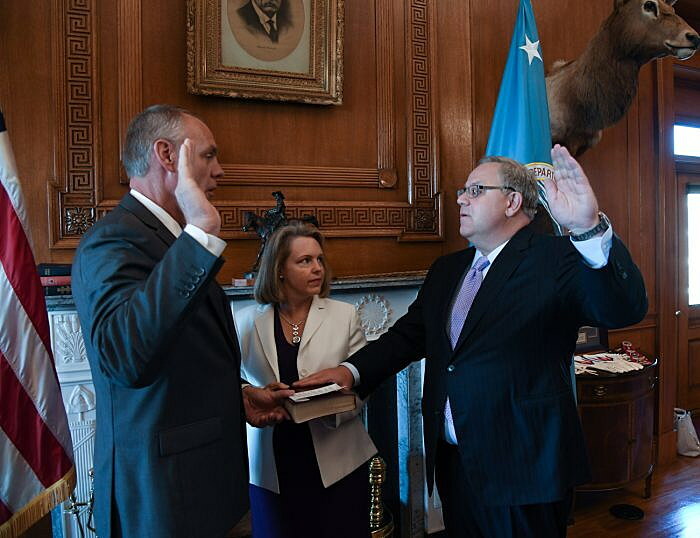 Since then, many environmentalists have watched with dread as Bernhardt was nominated by the president and moved through the confirmation process, which concluded Thursday when the Senate approved the nation’s new Interior secretary on a 56-41 vote. Montana Wilderness Association executive director Ben Gabriel thanked Sen. Jon Tester for voting against Bernhardt but was displeased with Montana’s junior senator. “By voting for Bernhardt, Sen. Steve Daines helped ensure that oil and gas interests will receive priority treatment when it comes to the management of our public lands, at the expense of the thousands of Montanans whose way of life depend on those lands. Sen. Daines also put the Land and Water Conservation Fund at risk by voting for someone who wants to zero out funding for this hugely popular, bipartisan program that Montanans desperately need to access and enjoy public lands and waters and to improve the health of our forests and rivers,” Gabriel said in a statement. Prior to his contentious appointment as deputy Interior secretary in August 2017 – the Senate voted 53-43 – Bernhardt had spent eight years as a lobbyist and lawyer with Brownstein Hyatt Farber Schreck, one of the top U.S. lobbying firms, representing energy, mining and Western water interests that deal with the Interior Department. Republicans praised Deputy Secretary Bernhardt for opening millions of acres of public land to oil and gas leasing. But Democrats were less pleased. On Wednesday, 50 House Democrats sent a letter asking senators to oppose Bernhardt’s nomination, saying he should be disqualified due to conflicts of interest and his support for regulatory rollbacks. Over the past two years, the Whitefish-based Western Values Project hounded Zinke about his questionable expenditures and conflicts of interest while Interior Secretary. Now that Bernhardt has been confirmed, the organization is likely to file information requests to dig into Bernhardt’s ethics. A recent New York Times report showed Bernhardt may have violated the Lobbying Disclosure Act by continuing to lobby for a client through March 2017 after signing documents in 2016 saying he was no longer a lobbyist. Outside Magazine reports that Bernhardt is involved in 17 corruption-related scandals. “Rushing to move forward with Bernhardt’s nomination without clarification on his numerous ethical lapses and investigative requests is not only a disservice to the American people, but it also means that Interior will again be led by a secretary shrouded in scandal. Make no mistake: A vote to confirm David Bernhardt for Interior Secretary was a vote against our American birthright and the viability of our public lands for future generations,” said WVP executive director Chris Saeger in a statement. Derek Goldman, Endangered Species Coalition Northern Rockies representative in Missoula, said many wildlife advocates are worried about Bernhardt’s confirmation, because Bernhardt supports Trump administration efforts to severely weaken the Endangered Species Act. While working for his lobbying firm, Bernhardt personally argued one appeals case for his clients, challenging federal endangered species protections for imperiled salmon. Last July, as deputy secretary, Bernhardt announced draft rule changes that would make it difficult to protect species listed as threatened, such as grizzly bears and bull trout. Also, the rules would not allow the effects of climate change to be considered when trying to protect a species. However, not all groups oppose Bernhardt’s nomination. The Missoula-based Rocky Mountain Elk Foundation lauded Bernhardt for issuing a secretarial order requiring that access for hunting, fishing and other recreation be considered for all proposals that would exchange or dispose of public lands. RMEF also praised Bernhardt for issuing an order on March 28 creating a task force to prioritize the implementation of the new Dingell Act, the large public lands bill that created a large amount of wilderness and protected the national forest around Yellowstone National Park from mineral extraction.